R-More 472 has a R-Value of approximately 2.08 and is highly effective when used on metal non-heated or heated buildings in between the metal wall/roof panels and the red iron frame. 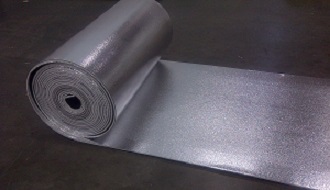 If installed correctly it helps to manage surface condensation on metal walls and ceilings. R-More 472 is designed as underlayment insulation to help reduce or prevent energy loss through thermal conduction or seams and cracks in walls. R-More 472 is a laminated product with ether durable metal, woven or clear polypropylene laminated facer and comes in thicknesses of 1/4" and 1/2" in rolls of 4' x 72'. Each roll is light weight with protective covers making it easy to unload, handle, apply or store. Copyright © 2017 - 2019 Crete Ready Foam and it's licensors.